De Carter - Ray, Master Glass Craftsman. I have been an artist since I was 5 years old. Actually I cannot remember a time when I have not made art. It is my passion. I have found it to be greatly rewarding and permits me a great outlet of energy, beauty, and elegance. Art is something that has a magic to it, actually I cannot imagine not doing it. It is spiritual in nature; I cannot tell you where it comes from? It is just there and I count on it without reservation. I see things before they are made; I just need to go through the steps to bring it into physical form.There are times when I completely get lost in the process for hours at a time, bound to it. When I finish the working phase of the project it is like waking up and seeing the finished product before your hands, backing up to take in the view. On larger installations where there are multiple windows it may take months or a year to complete, I have to physically see it later to appreciate the scope of the project as it is still too close. At the point of completion I am still in the A, B, and C’s of actually building it, not on the finished product. All judgment has to fade for me to to truly enjoy it. The Making of Art Glass is a great job. Clients have an idea at the studio we bring it to fruition. It is all about process, finding the right inspiration for a particular subject. Usually the art requested has a purpose. I will be given a space to work with, a subject matter, and the inspiration to fill it. My job is to listen. Take all the elements in to consideration, put a different spin on the ball and hand it back to them in a way that is workable, and attractive, hopefully better than what was originally thought. From there we agree on a budget and the process begins. One of the first things I communicate is that the glass is the cheapest thing they are going to buy; it is a starting point, the canvas. Depending on what we do to it is the piece itself. Whether it is sandblasted, deeply sculpted, optically bonded, or leaded glass, beveled glass, gold gilding, silver leafing, adding color, adding Jewels, to the surface of the material, or slumping the glass in a kiln, it is all done with end design in mind, and budget. The color and composition are constant; all of this is done in the back of my mind before putting pen to paper. I wake up sometimes in the middle of the night with ideas that are relevant to what I am currently working on. I get up and draw so not to lose it. Being an artist takes dedication, some of my best solutions come after meditation, then sleep. In the creating of it - does function follow form, or does form follow function? A client comes to me with an idea, be it a tiled glass backsplash, or an entry system, whatever the glass is to perform as. There are many different areas of glass that I work within, Modern, Art Deco, Traditional, is there a background that is driving the idea. Next the determination of what this art is to do. Is it to be private, is to decorate, and is to add drama to a space in a home. What is the size of it, and then the material is chosen to fill the space.I also have to have a working knowledge of code and how the glass works within the construction industry. Reading blueprints is a necessity. Understanding why things need to work in a particular way add yet another dimension to a project. All of this I bring to the table for people to work with. I like working with people it is interesting putting on someone else’s coat for a while and seeing how it fits. 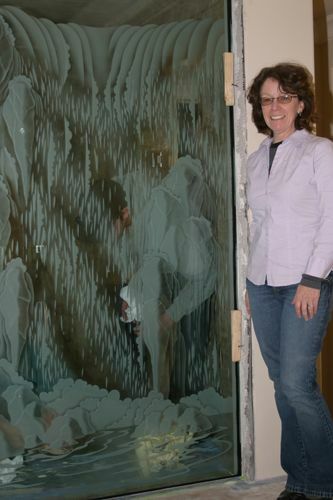 De standing next to a water fall that was designed and created by hand for this custom bathroom. The bath has a pass thru shower behind this waterfall, are two entrys from the right and the left. I am standing on the top of the tub rim next to the glass before on the day of the installation. Half of the pieces I work on I am unable to move.